Why should one rather go to Germany for fishing than into the beautiful Swiss Alps? Well, the Black Forest is amazing too. Furthermore, for people living in the northern parts of Switzerland, the Black Forest might be closer than some mountain provinces in Switzerland. 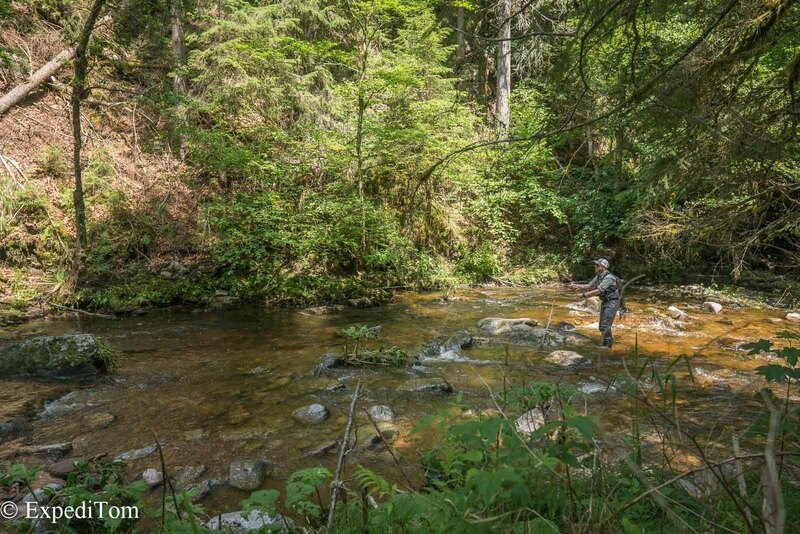 Additionally, some creeks offer a splendid populations of brown trout, rainbow trout and brook trout which have surprising sizes. The wonderful setting in the Black Forest is just the cherry on top. Another reason that contributes to a growing amount of people travelling to Germany is the cheaper food when compared to Switzerland. 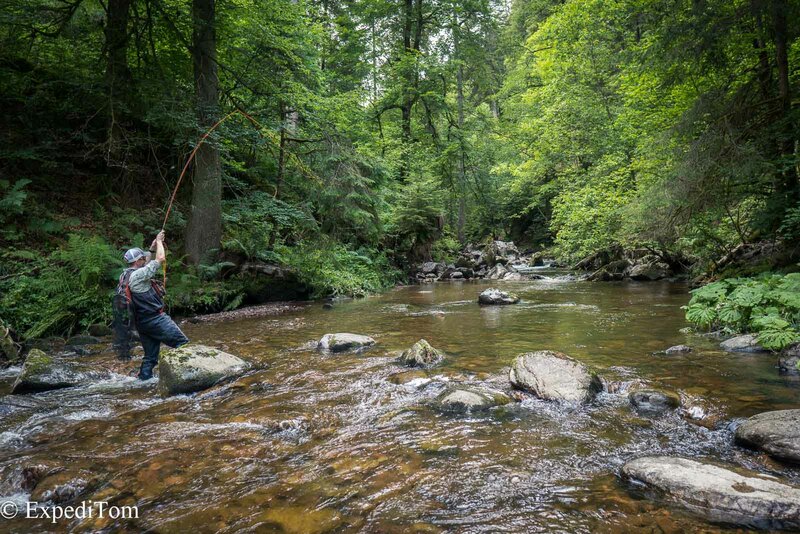 The regulation for fishing vary among the different areas in Germany. Therefore, I focus on Baden-Württemberg where the Black Forest is located. In order to be able to fish you need first the fishing license for Germany, which makes sure you know how to fish properly, and secondly you have to buy the regional license to go fishing in a specified area. As pointed out above, in other areas than Baden-Württemberg the rules vary. For instance in Bayern you do not need the national license to buy the local license unless it is valid for more than 3 months (see here). The national fishing license for Germany can be bought online or in the municipal administration (dt. : Gemeindeverwaltung). You can chose this license for one, five, ten years or even for you entire life. The national license for 1 year costs Euro 28.- and it attests you the competence in fishing. If you own a SaNa (dt. : Sachkundenachweis) license from Switzerland you can obtain the national license in Germany without having to pass a test. 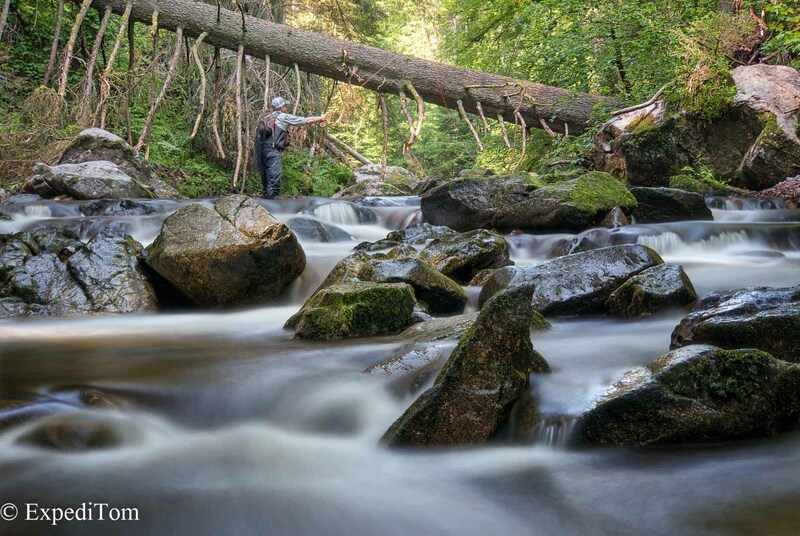 The best way to get access to the rivers in the Black Forest is to ask in the hotel where you stay. They usual know the people who own the rivers and help you. After we sorted out the red tape and bought both licenses, André and I could finally go fishing. The forecast predicted some rain in the late afternoon but we did not worry about this because the sun was shining. 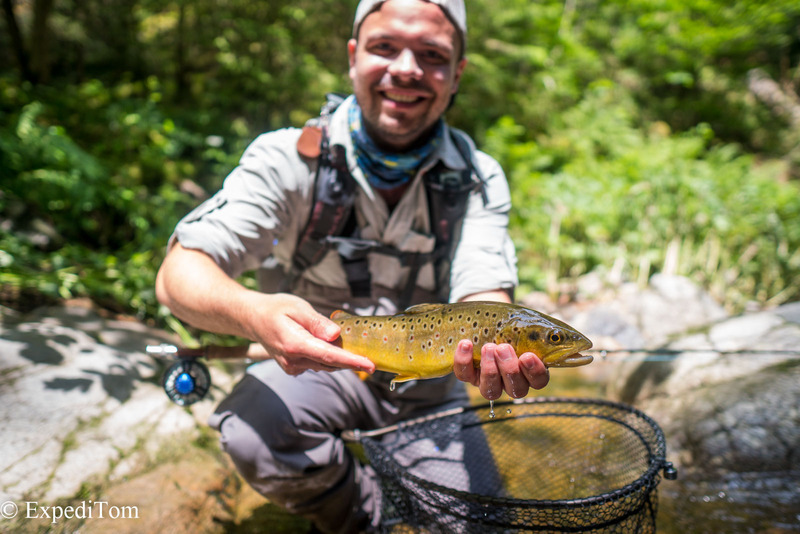 It was at the second pool that the first Black Forest brown trout took a Klinkhammer fly. 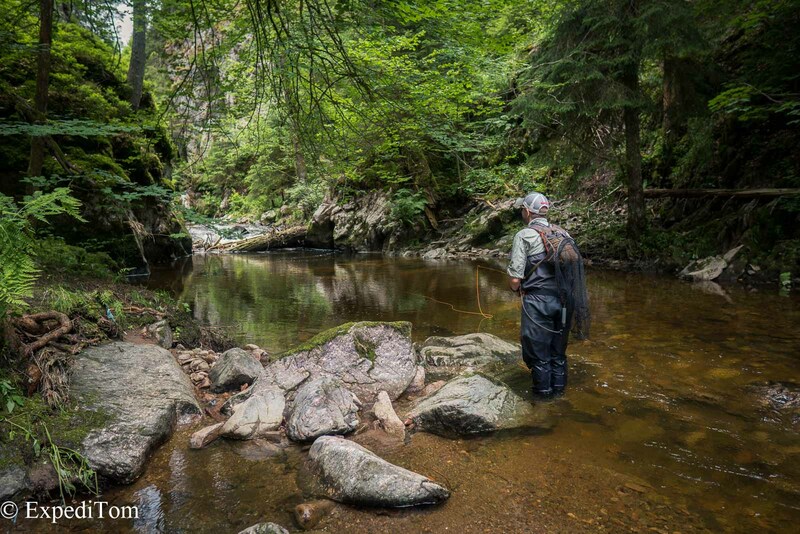 Continuing upstream, we entered more and more into the enchanted parts of the Black Forest. The creek was wonderful with its dark brownish tint and absolutely clear. However, a careful approach was key and we spooked several fish at first. Amazingly deep pool hiding some fish? The deeper pools we fished with nymphs to entice the larger fish to bite. 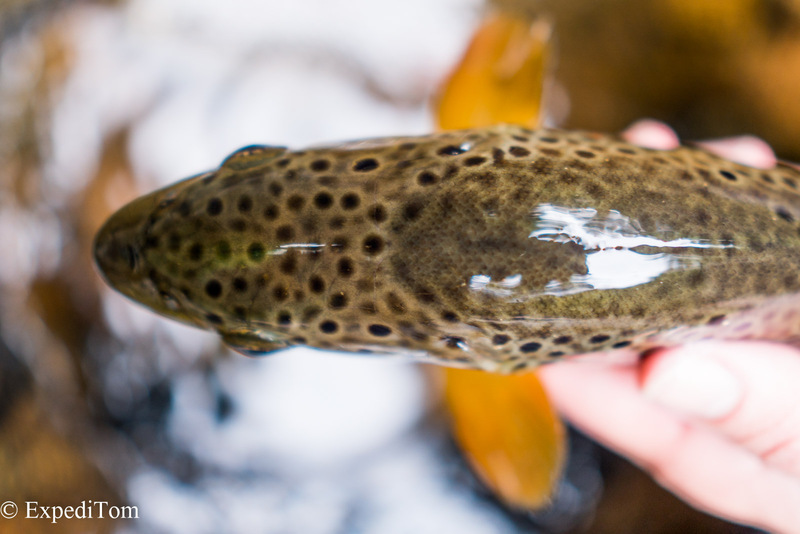 It was high-time to catch some bigger fish after I had not caught any remarkably large fish this season. André did well too with the dry and nymphs. At one point we thought we were not able to go any further, but with joined forces we managed to cross the amazingly deep pool to the gorge. Messing up a few fish with the dry, it was André’s turn with the nymph. After he lost a huge fish due to a broken knot, he hooked into another fatty at the head of the pool. In the end, we had to retreat hastily due to a heavy downpour and lightnings turning the beautiful creek into mud water and the Black Forest into a scarry scenery. I will be getting my national license here in a few weeks. I’ve been doing a lot of reading and have become familiar with the process to purchase permits for specific waters, but im unfamiliar with these waters. 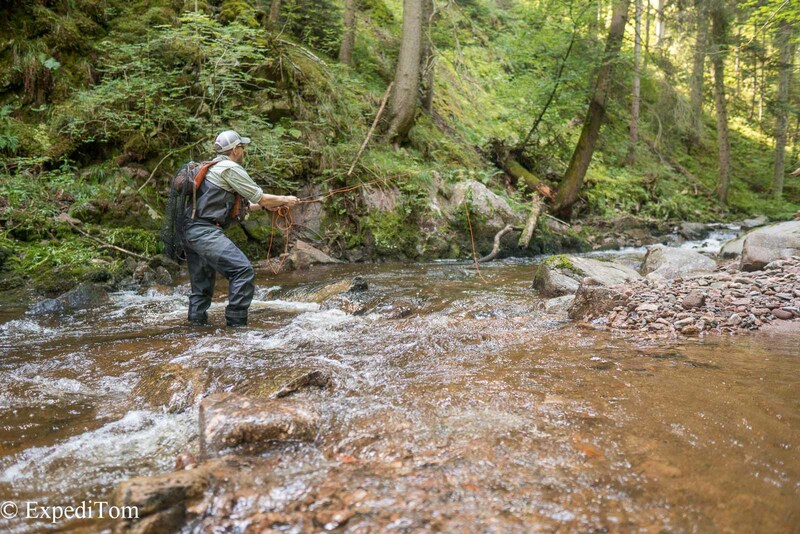 What exactly do I need to fish the Black Forest waters? Do you have links to where I may read more about how to be come fully legal to fish? Thanks! I cannot tell you the exact place where I fished, so it is not possible to say where I bought my license. However, I can advise you to get in contact with accommodations such as hotels who will point you in the right direction. Sorry for not being of great help here. My name is Josphat coming from a family in Kenya where my father has been a tier, supervisor and manager of fishing flies in Unwin and sons fishing company. With such experience of 43 years he managed to get two customers one from UK and another one from Italy who orders an average amount of dozens of fishing flies from our company for 7 years now. Am humbly writing this to request you if you are in a position of buying from us quality flies of your choice or liaise us to buyers to help us enhance/expand the company and I promise we shall both mutually benefit without regrets. I graduated from university 4 years ago and failed to secure a job. 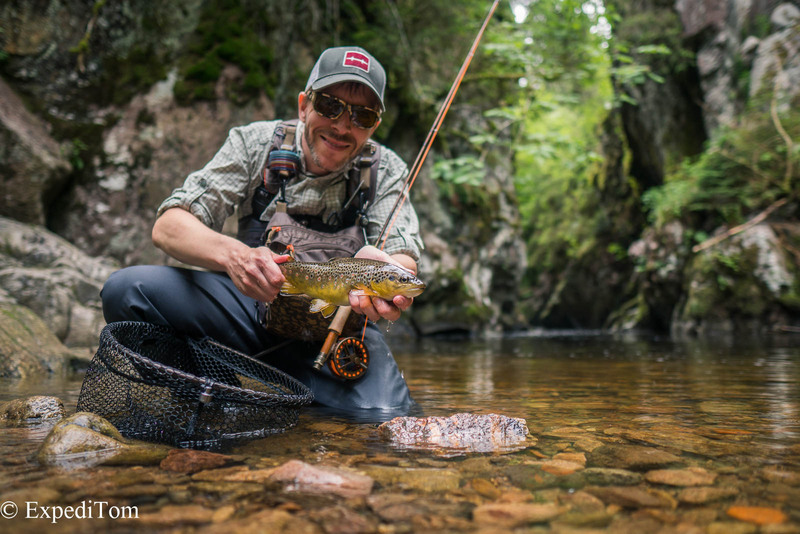 I equally have experience in fishing flies and am dedicated to work hard in this business. In case you need samples for approval, we are ready to ship them. Find attached the list of patterns we tie and their prices.